Although Timesheet Mobile caters to businesses who need to keep track of mobile employees, we understand that many employers also have workers who are office-bound for at least some portion of the work week. Instead of requiring these employees to download the app and carry their phone around with them throughout the day, we now offer a desktop punch method. 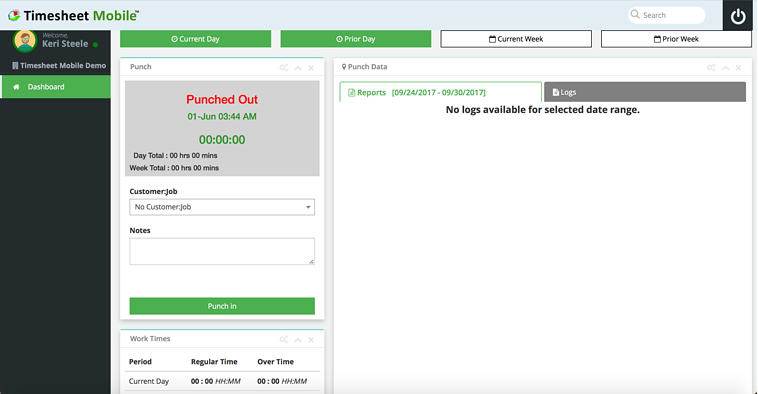 Employees who use the website to punch in and punch out will not receive Punch Prompt alerts. You will need to grant each applicable employee permission to punch in via their desktop. For employees with an active profile in your system, select Employees on your dashboard screen, click on the gear icon next to the selected employee and click on Edit. In the pop up window, click the box next to Allow Website Punches. This will launch a screen and ask you to confirm your action. Select OK, enter the employee's email as prompted and save your changes. Timesheet Mobile will generate an email to that employee with a temporary log in password, allowing access to website punching. If you'd like to set up a new employee to use desktop punch, click on Employees on the dashboard and then click on Add Employee. In the Employee Details screen, enter your employee's information. Then click on Send Email Invitation AND Allow Website Punches. Your employee will receive an email with a link to the website as well as a temporary log in password allowing access to website punching. Authorized employees will then log into their account and see this Punch screen. They can then select the Customer:Job assigned to them by their managers and click on Punch In to start the clock. Employees can view current hours, prior day hours and weekly totals by clicking on the tabs above the punch clock.